Over the past two years Highways England has seen a rise in the number of falls from road and plant vehicles resulting in 12 RIDDOR reportable injuries, representing 13% of the total. These have included three broken legs, three broken ankles a fractured wrist and five serious sprains. Seven of these incidents involved traffic management operatives. Many of these incidents have occurred when people egress vehicles on to uneven ground including planed edges, kerbs, debris and excavations. Other causal factors have included inadequate planning, poorly designed vehicle access, equipment maintenance, poor housekeeping, drivers ‘jumping’ down from vehicles and poor lighting. With this in mind please ensure you are doing all you can to mitigate this risk. Most of these accidents can be avoided if everyone on site does their bit to make the workplace safer. 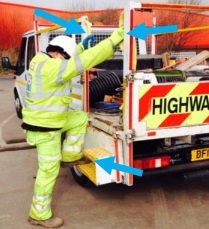 Resource information, available on the hub H&S website (www.highwayssafetyhub.com), is aimed at raising awareness on common and often repeat issues presented during access to and exit from vehicles, items of mobile plant equipment and the beds of trailers and above. It should be noted that this topic has and remains an issue in all industries and walks of life, not just in a highways working environment, but that simple controls are available for use by everyone to remove, reduce and control everyday risks / hazards presented. To help reduce the number of loading and unloading of vehicles related injuries and incidents, recognising the benefit of common user controls (minimum standards) and by promoting learning, understanding and good practices for operations where loading and unloading vehicles is undertaken. Three million people in Great Britain work on or near vehicles as part of their regular job. Access to vehicles to carry out loading/unloading operations and working at height from vehicles and the beds of vehicle trailers and above are often viewed as incidental to the main job. Because of this, the risks involved may not be properly considered by both workers and their managers. In addition the loading and unloading of vehicles needs to be carefully planned as access to the bed of a vehicle is only one of the risks associated with loads and vehicle use. List below are examples of safety alerts, bulletins and tool box talks, issued by contractors as a means of raising awareness to the hazards, and controls available in the prevention of “slips, trips and falls from vehicles and on the beds of trailers and above”. In addition, they are listed in alphabetical originator name order, but moving backwards in time emphasising that irrespective of when messages were produced, whilst slips, trips and falls remains a common (repeat) issue, key learning and the development of controls has progressed and understanding improved… THEY JUST NEED TO BE USED!